2015/16 Upper Deck Series 1 Hockey Factory Sealed 20 Box CASE-40 Young Guns RC? 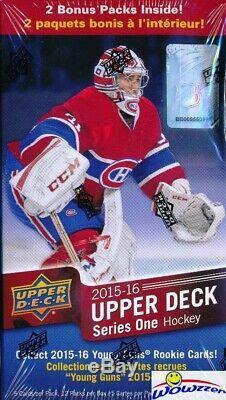 We are proud to offer this SUPER HOT Original Factory Sealed CASE of 2015/16 Upper Deck Hockey Series 1! 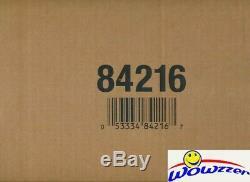 This Factory Sealed CASE includes TWENTY(20) Factory Sealed Blaster Boxes! Each of these HUGE Factory Sealed Boxes includes 12 Pack and 5 cards per Pack! Look for Young Guns Rookies found 1 in every 6 Packs! So On Average you GET TWO(2) YOUNG GUNS Rookies In EACH Factory Sealed Box for a Total of FORTY(40) IN this 20 Box Factory Sealed CASE!! Collect the Best Class of Young Guns Rookies Since 2006/06, including Superstar Holdovers! Plus Every Box on Average includes One of the Super Popular UD Canvas Insert and Uncover Shining Stars Inserts! Look for Autograph and Game Used Jerseys of all your favorite Rookie and Stars! Look for Awesome Parallels and Insert Cards! Good Luck with your pulls!! 1 in every 50 Young Gun Card is Connor McDavid Young Gun Rookie! Connor is a Once in a Generation Talent who We believe is going to Re-Write the Record Books! Wait to pay until all items have been won OR 3 days after oldest item was won. (Please Note - we are not open on the Weekends and Holidays). We will NOT list a lower value or mark orders as gifts. We answer all emails within about 24 hours, Monday through Friday, and work to resolve all problems as quickly as possible. Unless an item is damaged, it generally needs to be in the condition it was received, either undamaged or factory sealed, to be eligible for a return. Note on Factory Sealed Boxes and Cases and Graded Cards. S samples and are not guaranteed to be in any particular box or case. On Listing for Beckett BGS Graded Cards. We answer all emails within about 24 hours Monday through Friday. - Vendio Counters are active content free. The item "2015/16 Upper Deck Series 1 Hockey Factory Sealed 20 Box CASE-40 Young Guns RCs" is in sale since Wednesday, March 20, 2019.